Another excerpt from my revised and much-expanded introduction to my translation of Francisco I. Madero's Spritist Manual (forthcoming in paperback, Kindle and iBook this year; the link goes to current first edition available only on Kindle). Francisco I. Madero was the leader of Mexico's 1910 Revolution and President of Mexico 1911-1913. As Mexican historian Enrique Krauze eloquently argues in his biography, Francisco I. Madero: Místico de la libertad, in the case of Madero, "Politics does not displace Spiritism, it is born of it." So, whatever one's personal opinion of Spiritism may be, Madero's Spiritist Manual of 1911 (written in 1909-1910), becomes a key document for understanding the Mexican Revolution. Note: The excerpt refers to Pachita, the Mexican "psychic surgeon"-- another excerpt about her will be posted soon. gentle, playful nature, as a boy, Fidencio was taken underwing by a German-born Spiritist named Teodoro von Wernich, who recognized and encouraged his development as a mediumistic healer. As news of Fidencio’s healing powers spread, increasing numbers of pilgrims arrived in his remote desert home in Espinazo, Nuevo León, so many that the place became a tent city, with its own post office, and far more substantial than Teresa Urrea’s colossal gatherings, or “romerías” of Mayo Indians, Yaquis and mestizos all yearning for her magic touch, that had so disturbed the Porfirian authorities. The apogee of Fidencio’s career came in 1928: President Plutarco Elías Calles, seeking healing for a skin ailment, pulled into Espinazo on his private train. Espinazo was not in my travel plans, but I was able to visit from my armchair by means of Juan Farré’s documentary, Niño Fidencio: de Roma a Espinazo. Ancient ranch people, their voices slow, eyes rheumy, remembered Fidencio, contradicting each other about the color of his skin. One said the Niño cured President Calles by slathering him in honey. The camera panned slowly over the jars immortalizing the tumors the Niño had extracted using his specially-chosen piece of broken glass. An old blind woman who had known Fidencio told the story of a boy who had been swimming in the ocean with two friends, and when the two were eaten by a whale, he was so shocked he could not longer speak. In Espinazo, Fidencio put him on a swing, pushing him so high he screamed and was cured. Another old woman said the Niño operated on cataracts using a razor blade. Another remembered that he fed the lepers boiled coyote and vulture, but they all died anyway. More techniques: the Niño would smack people with an apple or a tejocote. On others he would sic his mountain lion, a declawed pet named Concha. He might climb up onto a swing, holding a paralytic close to his heart, and then, when the swing stopped, the man would walk—said one devotee. The variety in Fidencio’s repertoire seemed endless: plants and herbs and the Charquito, or “little puddle.” In a sunny contemporary scene in the Charquito, men who might have been truck drivers spread their arms wide and fell backwards; a circle of pilgrims, the water jostling above their their knees, held hands, closed their eyes and prayed. Zombie-like men, women, children, hair and faces covered in mud, sloshed through the waist-high murk. Alongside the Charquita, to the pound of drums, dancers with headdresses of quetzal feathers and rattles on their ankles stomped and whirled. On the ground, a teenager slowly rolled, over and over, his T-shirt becoming yellower and yellower with dirt. Fidencio, said another of the old timers, knew he was going to die. But he said, “Don’t bury me right away because I am going to rise on the third day.” With the news of his death, pilgrims rushed in from all over northern Mexico and parts beyond to witness the miracle. But their “saint” did not revive, or at least, not in the way they were expecting. 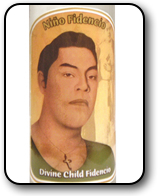 Some of the fidencistas believed they could now enter a trance and receive his spirit, so that, through them, the Niño could continue his work. These materias, or mediums, call themselves cajitas, or “little boxes,” and they wear white robes trimmed in gold and capes the colors of popsicles. Their modus operandi is to stand close to their patient, a hand on his shoulder, and whisper into his ear words of compassion and instruction in Fidencio’s babylike voice. I watched as they, too, shiny capes and all, waded into the Charquito. Someone dumped a bucket of mud over a child’s head. More men fell backwards, stiff as planks, splash, into the chocolately soup. The film’s finale was rare footage, a scratchy black-and-white flickering, of Fidencio, from on high, pitching fruit at his followers; then, like a rock star, writhing over a mosh pit of their arms; everywhere arising from that carpet-like tangle of humanity, hands, more hands, hands like hungry spiders on his hair, his hip, his shoulder, his foot. When imagery such as this is the first thing that comes to mind for many of Mexico's intellectual and political elite when Spiritism is mentioned, perhaps we can understand the desire to suppress or ignore the Spiritist beliefs of a national hero. Don Francisco I. Madero was also a healer who ministered to those too poor to pay a doctor, many of whom might have been no different than the grandparents of those old ranch people in the movie about Fidencio. But no, he did not perform “psychic surgery” nor thrash around in a mud pit or chuck apples at anybody. Madero performed hands-on "magnetic" healing, hypnotism, which he apparently learned from French books, and homeopathy, a German doctor’s innovation of treating illnesses with remedies of “like with like,” tiny white sugar pills infused with extremely diluted substances. But Madero's true calling, as he understood it, was to heal the Mexican body politic. When Madero finished with his studies in France and boarded his ship to Mexico, neither Fidencio nor Pachita had yet been born. Teresa Urrea, the “Santa de Cabora,” heroine to the Tomochitecos, had just fled to Nogales, Arizona. Madero’s fellow mystics would prove to be a more educated, more literary-minded type: among them, Porfirio Díaz’s own Secretary of Foreign Relations, Ignacio Mariscal. And after Madero, a small but adventurous portion of Mexico's intellectual, political, and scientific elite was dedicated to communicating with disembodied consciousnesses. I send interested readers to Una ventana al mundo invisible (A Window to the Invisible World), a now very rare book published in 1960 which contains the detailed records of dozens of séances held from 1940-1952 and lists of their participants--among them, both in life and in spirit, Plutarco Elías Calles-- for the Instituto Mexicano de Investigaciones Síquicas (Mexican Institute of Psychic Research). Onward now to Madero’s metaphysical odyssey. As you know, it is going to end in a slick of blood. >Visit the book's webpage, with more excerpts, Q & A, and resources for researchers. > I welcome you to sign up for my free every other monthly-ish newsletter. BUY THIS BOOK- link to amazon.com for paperback, Kindle, and Spanish editions.